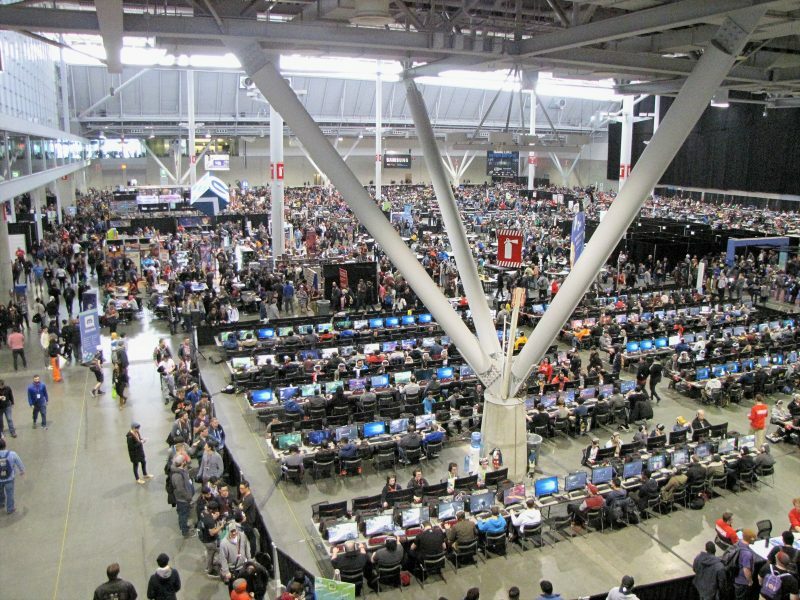 PAX East concluded yesterday, and I am completely exhausted. Fortunately, the internet tells me that today is National Napping Day, so I won’t feel so bad when I inevitably fall asleep at my desk. I look forward to attending PAX every year, and this year didn’t disappoint. My goal this year was to play as many games as possible, so I spent a lot of time in the tabletop section. This is my third year, and I think after your first experience you have to resign yourself to the fate that you will never see a fraction of what you want to see over the weekend if you’re ever going to return. I told myself going in that I would be fine missing panels or seeing the hot video games, because I wanted to play board games. Everything past that block of computers is tabletop. There’s even more in the main expo hall and more to the right of this picture. Fortunately, tabletop has nearly doubled in size since my first PAX 3 years ago, so there was a lot to see. Mayfair, White Wizard, and North Star Games, among other smaller publishers, managed to get quite a bit of space in the main expo hall, which was great to see. No wonder, then, that Penny Arcade has announced PAX Unplugged, which should be absolutely fantastic. I’m already on the mailing list and ready to buy tickets. 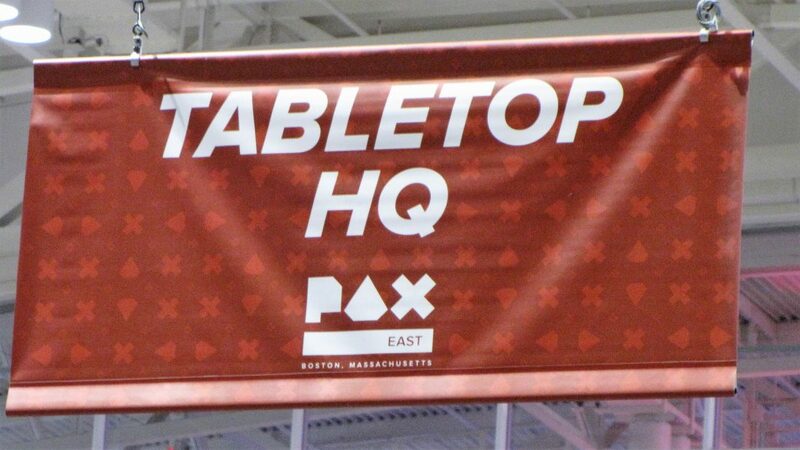 I don’t have very much experience with conventions generally, but I get the impression that PAX is exceptionally well-run, so one dedicated to tabletop gaming is a dream come true. I was fortunate to be able to go to PAX with my friends Orion, Matt, and Wes, whose voices you will hear on Thursday when Podcast Episode 1 is released. We attended the board game night at the hotel next to the convention center on Thursday and had a great time! We managed to play a game of Scythe, which is always enjoyable, and then after much searching, found enough room at one of the tables playing Secret Hitler to join in. I was able to play Secret Hitler last year at PAX, but Orion and Matt hadn’t played it before. Given our mutual love of The Resistance, this was definitely a priority. I think the consensus from the others was the same as my perspective: Secret Hitler does a good job taking the basic structure of The Resistance and tweaking it a bit. It’s not as good as its predecessor, due to balance concerns and the fact that it lacks the purity that we all love about The Resistance. But if you, like us, have worn out your copy of The Resistance, Secret Hitler is definitely a game you should try to spice things up a bit. As soon as I saw that Fantasy Flight would be hosting a Netrunner tournament I knew that was going to be the bulk of my Friday at PAX. This was an excellent tournament and I’m glad I attended. Orion and I will talk about this more on our Netrunner Podcast later this week, but basically I tried to win and Orion tried to have fun with his ridiculous decks. At the end of the day we both had close to even records. I finished 4-3 with a timed win. Orion had some success with his brain damage centered deck, but couldn’t do much on the runner side and finished 3-4-1. Unfortunately my timed win put me at 14 points, which barely pushed me out of the top 8, who all got some really sweet full-art cards. After getting some food and attending a talk, we decided to check out the large board game library on site and see if there was anything there that we’ve been wanting to play. Mechs vs. Minions was at the top of our list, but it was a super hot item and the library only had a couple of copies, so I never had a chance to grab it. 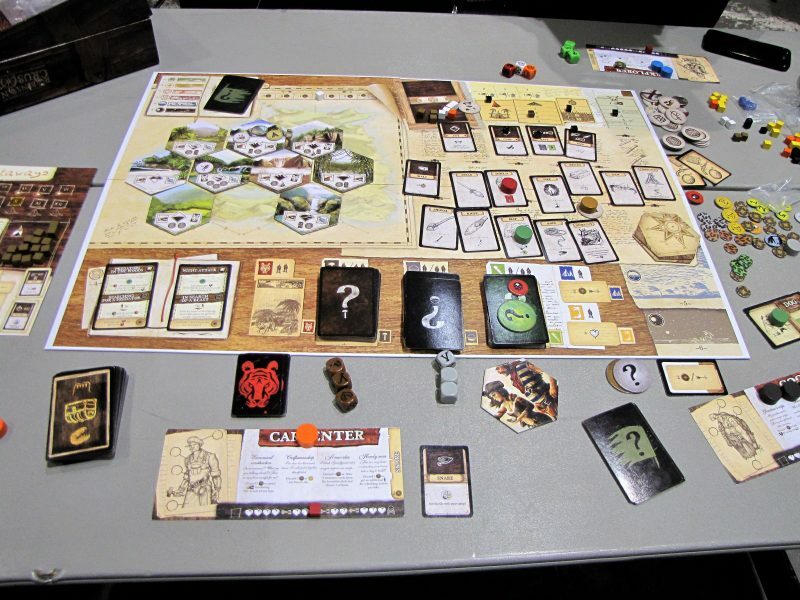 We did, however, see Ignacy Trzewiczek’s acclaimed co-op game Robinson Crusoe and jumped all over it. I had heard that the rulebook in the first edition was bad, but I still underestimated how difficult it was going to be. Picture taken at the end of the game, because I was too busy wishing I could strangle the rulebook to get my camera out at the beginning. It was such a bad rulebook. Really really bad. Fortunately that was overcome by how fantastic the game is. I haven’t been excited by a new play of a game in a very long time. This game has skyrocketed up to the top of my wishlist. I want to play more scenarios! I want to see what other dangers the island has to offer! It’s one of those games that manages to both highly thematic without sacrificing interesting decisions. We talk more about this on the podcast, but the absolute best part of the game was the fact that whenever you do something risky (like exploring alone), you roll some dice to see if you succeed, take a wound, or more significantly, draw a card from the mystery deck, which tells you something that happens while you were exploring. Every one of these cards has a consequence, most of which seemed to be bad, of course. But then you take that card and shuffle it into the event deck, and it comes back to bite you later. It’s an absolute thrill to find out that the berries you ate an hour ago all of a sudden made you nauseous, so you lose one of your action cylinders the next round. We played the opening scenario, which was fun, although I suspect it’s meant as a tutorial of sorts, because we found it somewhat easy. The two areas where you have random, scenario-specific effects said “no effect” for this scenario, so there were quite a few situations where nothing happened when, in a different scenario, we would have gotten a bad event. An absolute blast, though. I can’t wait until my next board game purchase, so I can buy the second edition with the improved rulebook. Because seriously, the rulebook was AWFUL. Feeling brave, I wandered though the expo hall a large chunk of Saturday. Very little of the video game content ended up being interesting to me, but I think partially that’s because the expo hall is such an overwhelming place. It’s packed to the brim, and if you want to do anything you need to wait in line. I did manage to find an open seat at the White Wizard booth, however, to demo another game I’ve been wanting to play for a while: Star Realms. It’s a clever little deckbuilder game that simplifies the genre probably about as far as it can go. The reps at White Wizard were universally enthusiastic and a pleasure to talk to. 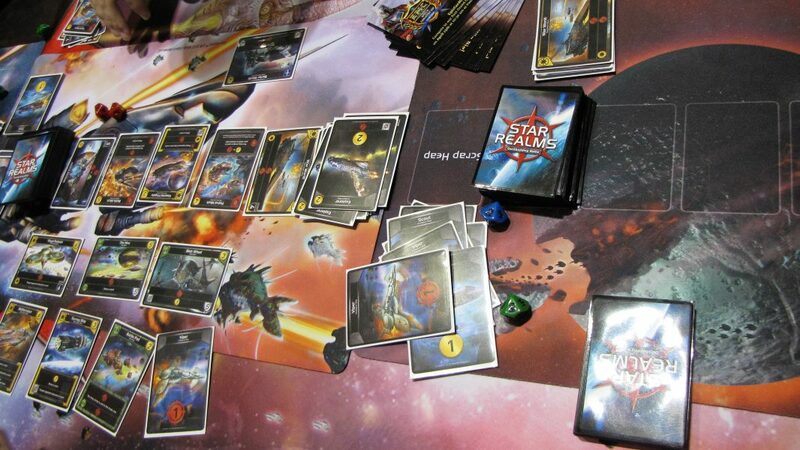 Star Realms is clever and fun, and at $15 I couldn’t pass picking up a copy. I still think Dominion is the king of pure deckbuilders that I’ve played, but there’s no way it’s going to fit in my pocket and take 10 minutes to play. It doesn’t hurt that I managed to convincingly win my first game. White Wizard was also demoing their fantasy-themed version of the game, called Hero Realms, and a LCG-style game called Epic. I considered buying Hero Realms instead, especially after the rep pitched to me all of the cool expansion content they were developing, but I’m not sure that the game could hold up to more robust changes, and it wouldn’t fit in my pocket. Plus I like space ships. Matt and Orion got to demo Evolution: Climate and they both came back with glowing reviews. From what I can tell it’s a quick card-based game about trying to evolve a species to survive the dangers of the wild (and a shared watering hole). Apparently both of them immediately became carnivores and preyed upon the other players. Feel free to speculate about what this says about them as people. Matt and I also checked out the board game section of the Indie Megabooth, where independent designers got to show off their designs. 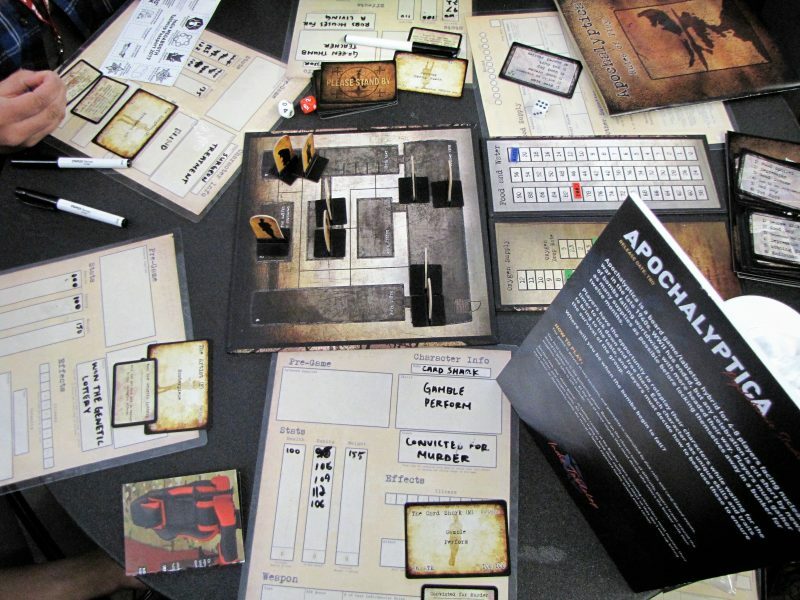 One of the most interesting games there was an RPG/board game hybrid called Apochalyptica. My character was a convicted murderer, and as the DM pointed out with a little bit too much glee, everyone in the bunker knew it. The basic premise is that the nukes have been launched and everyone gets a couple of hours to find supplies and book it towards the crazy paranoid neighbor’s bomb shelter. The only problem is that there are 12 of you and the bunker only fits 8. After you decide who to leave to the radiation, the actual game begins. We only got an abbreviated preview, but the game leans much more towards the RPG side of things than I was anticipating. We were assured that you can play the game “straight”, although it seems like that might result in a boring game. The actions were simple, and the game has a variety of means to encourage role-playing. It should be up on kickstarter in the next couple of months. After the expo hall closed we immediately went back to the tabletop area to learn some more new games. The first game we picked up was Alien Frontiers, a dice-based worker placement game that I had heard good things about. Unfortunately, this was the biggest dud of PAX for us. I did, however, just find out that we were playing a rule wrong, so I’m willing to give the game a second shot. Regardless of the rule mistake, none of us found the game particularly interesting across the board. The actions available were fine, the cards were fine, the point scoring system was bland, etc. The rule we messed up on does alleviate some of our concerns about how action spaces never seemed to be scarce, but it doesn’t really fix our biggest complaint about the game: the “Raiders Outpost” action was extremely powerful. This is the only part of the game where you can actively steal resources from another player, and it was powerful to the point of annoyance. I don’t think playing the game correctly will improve it much, but maybe someday I’ll give Alien Frontiers another shot. After that we only had about an hour until a panel we wanted to attend, so I grabbed Roll Through The Ages: The Bronze Age, by Pandemic designer Matt Leacock. I love the original Through The Ages and while I knew this game had very little connection to Vlaada Chvatil’s brilliant design, I decided to give it a try. It turns out that Roll Through The Ages is a quick variation on Yahtzee, and we had a pretty good time with it. I don’t have much to say here, other than that I’d play it again, but I doubt I’ll ever purchase it. 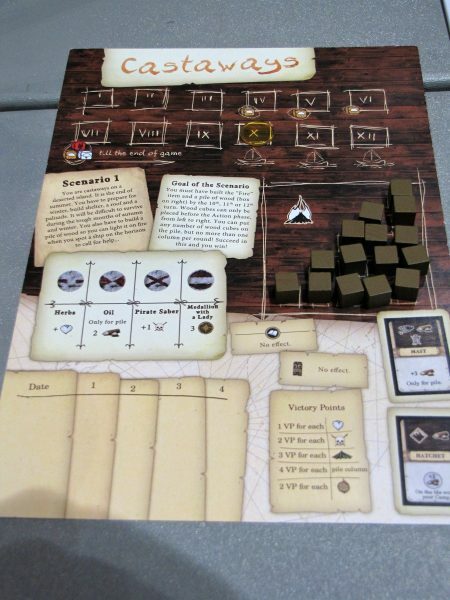 If you have someone you want to buy a game for, but they don’t have any modern board game experience, this might be one to consider, because it has the common Yahtzee reference point that will make it easier to learn. We crashed hard. Only Matt managed to make it to the third day of the convention. The rest of us stayed at home and mostly slept. But I don’t think we regretted it. PAX can be an overwhelming and draining experience, and I had a wonderful time. Plus, we managed to record a podcast Sunday evening which I am going to edit right now for Thursday’s post! In it we go into more detail about the games I mentioned above and generally act sleep deprived. In summary: PAX is a great time. If you haven’t attended one yet, there are 5 different ones each year–Prime in Seattle, East in Boston, South in Texas, Australia in…..well, Australia, and now PAX Unplugged in Philadelphia. Share you PAX stories below! What did we mess up in Alien Frontiers? You’re not supposed to pick up your dice from the board until your turn begins. There are no set rounds like we were playing it. Oh, that makes a lot of sense… I guess that could even out the raiders action, but it could just give one player an extended monopoly there. Thanks for letting me join in on Scythe. I missed last year but made it the two years before. The open tabletop gaming area was similar in size this year as it was to my first year; two years ago and apparently last year, there just weren’t enough tables, so I was happy they re-expanded the section again this year. It was really frustrating having found people to play with, and a game to play only to not be able to find a spot to sit. From my first year, I discovered that I find walking through the main expo hall should be the first thing you do. Friday before noon or so there’s still enough room to move around (to be fair, it seemed roomier this year all around) plus you can get a good lay of where specific things are you want to check out later. I also saw and was very intrigued by Apochalyptica; though I never did get to go back and get the full playthrough with them, I see a lot to like in that game and also designers who played a lot of fallout.